The Rex FP lifting platform uses a single pantograph lifting system (scissor lift) to serve up to 3.5 metres, with a capacity up to 3 tonnes. 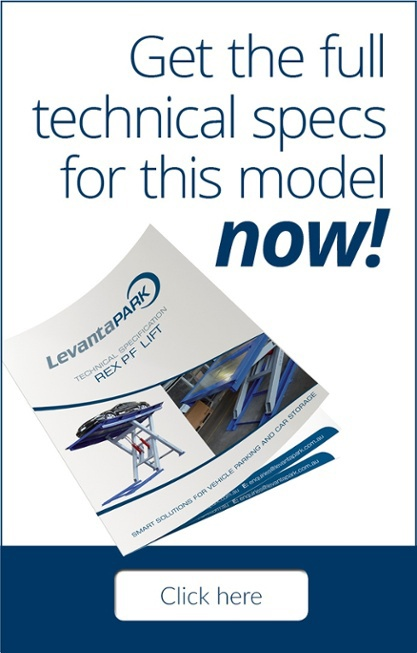 Rex FP is a strong, very versatile car parking lift that can accommodate vehicles with heavy engines and extremely long wheel bases, thanks to its 5.2 metre platform. Optional platform sizes up to 5,600mm in length and 3,000mm in width are available. Rex FP (Fixed Point) is extremely versatile when parking motor vehicles. Its generous 5.2 metre platform and 3 tonne weight bearing capacity allows it to accommodate even vehicles with heavy engines and long wheel bases. The Rex FP is not only extremely compact (with the platform structure requiring a pit of just 510mm), it’s also extremely study. For the utmost safety, the front and rear wheel stops ensure that the vehicle is correctly positioned, and prevent any abrupt forward movement of the vehicle while the platform is moving. The reliable Rex FP allows any type of vehicle to be parked with its heaviest section (the engine and transmission) set on the unsupported part of the platform, without compromising the unit in any way. To ensure outstanding reliability, the underlying part of the Rex FP platform is supported by a steel skeleton. The Rex FP platform can be adapted to the width of the stored vehicle by varying the width of the side platform profile, increasing the support space. The two bases on which the Rex FP legs slide are secured to the ground with mechanical anchors. The wheels are installed with wear-resistant plastic bushes that prevent friction, extending the life of the unit. The Rex FP fixed frame also has a base secured to the ground with mechanical anchors. Its clever design features a pin inserted into the wear-resistant plastic bushings to maximise the product lifespan. The Rex FP hydraulic system features two pistons, each fitted with a differential valve able to read differences in oil pressure. If such changes occur (for example, if a hydraulic connection breaks or there is a major oil leak), the solenoid valve immediately closes the connection between the piston and the hydraulic connections, thus preventing oil from flowing out of the piston. Additionally, two separate limit switches set on a shaft to the left of the piston are used to regulate platform travel. On top of that, a third limit switch acts as a safety back-up which cuts in if in the unlikely event of a double failure. Rex FP’s electrical circuit is perfectly integrated into the lift yet is still easily accessible for maintenance. For exceptional accessibility, the junction box connecting Rex FP to the electrical control panel is set on the lower spacer of the fixed point leg. And to ensure seamless, fast installation, all electrical systems come pre-installed on Rex FP. To speak to a LevantaPark parking expert, use the form below. Do your car lifts meet Australian Standards? Copyright ©2019 LevantaPark. All rights reserved.